Tours de Sport's Blog: Best Snowfall in Five Years! Banff/Lake Louise. Best Snowfall in Five Years! Banff/Lake Louise. 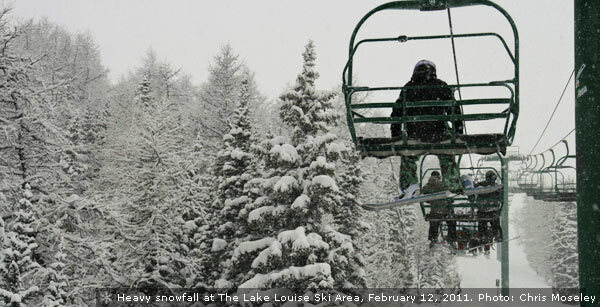 The snow is continuing to fall in Banff-Lake Louise, with almost half a metre of snow this past week. This follows the best January in five years for snowfall. Last month, 167cm of dry, light snow blanketed the area – well above the 30 year average. Bright blue skies between the snow storms and mild temperatures have produced amazing conditions for skiers and riders at Mt. Norquay, The Lake Louise Ski Area and Sunshine Village. And there’s plenty of time left to enjoy it with three and a half months of skiing still to go in Canada’s Protected Playground, Banff National Park. 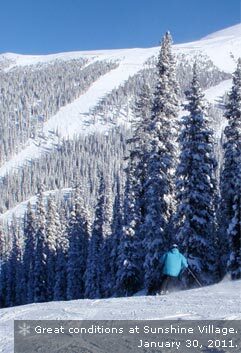 Build your own custom quote or call today and let one of our Canadian Ski or Ride specialists plan that perfect winter holiday.